The 80th consecutive success for Arianespace’s heavy-lift Ariane 5 lofted two satellites today, delivering new capacity for use in the distribution of TV and video content, telecommunications services, mobile satellite services, data relay, along with coverage of search and rescue missions. Orbited by Arianespace Flight VA238 from the Spaceport in French Guiana were a so-called “condosat” composed of two payloads for Hellas Sat and Inmarsat, along with a spacecraft for the Indian Space Research Organisation. Ariane 5 ascends from the Spaceport in French Guiana on its 80th consecutive launch success. On its fourth mission at the service of Arianespace this year, the Ariane 5 had a payload lift performance estimated at 10,136 kg. to geostationary transfer orbit, maintaining the company’s sustained launch pace in 2017. Riding as the upper passenger on Flight VA238 was Hellas Sat 3-Inmarsat S EAN, which integrated two relay payloads. The payload for Hellas Sat 3 will expand this company’s business reach by providing direct-to-home (DTH) TV broadcast and telecommunications services, as well as the distribution of high-definition (HD) and ultra-high definition (UHD) video content in Europe, the Middle East and sub-Saharan Africa. These fixed satellite services (FSS) and broadcast satellite services (BSS) include a cross-strap service between Europe and South Africa. Christodoulos Protopapas, the CEO of Hellas Sat, congratulated Arianespace on successfully orbiting the Hellas Sat 3-Inmarsat S EAN spacecraft, and said he was looking forward to the launch of his company’s next satellite – Hellas Sat 4 – scheduled on an Arianespace mission in 2018. Also integrated on the Hellas Sat 3-Inmarsat S EAN satellite is a relay payload for a system developed by Inmarsat with Deutsche Telekom to offer high-speed, high-capacity Wi-Fi connections for airline passengers. Inmarsat is specialized in mobile satellite communications, and the first customer for this airborne connectivity is the International Airlines Group (AIG), which has begun equipping its aircraft and aims to have 90 percent of its short-haul fleet complete by early 2019. Inmarsat Chief Technology Officer Michele Franci thanked Arianespace as part of the European effort that will bring cabin connectivity to passengers across Europe. “This satellite was riding on one of Europe’s best successes – Ariane,” he added. Weighing an estimated 5,780 kg. at liftoff, Hellas Sat 3-Inmarsat S EAN was produced by Thales Alenia Space using its Spacebus 4000C4 platform. With the satellite’s successful launch today, Arianespace has now orbited a total of 149 spacecraft built by the company – continuing a long-time partnership. Bertrand Maureau, Executive Vice President – Telecommunications at Thales Alenia Space, acknowledged Ariane 5’s mission performance this evening, and noted that Hellas Sat 3-Inmarsat S EAN was the fourth satellite from his company launched by Arianespace so far this year. 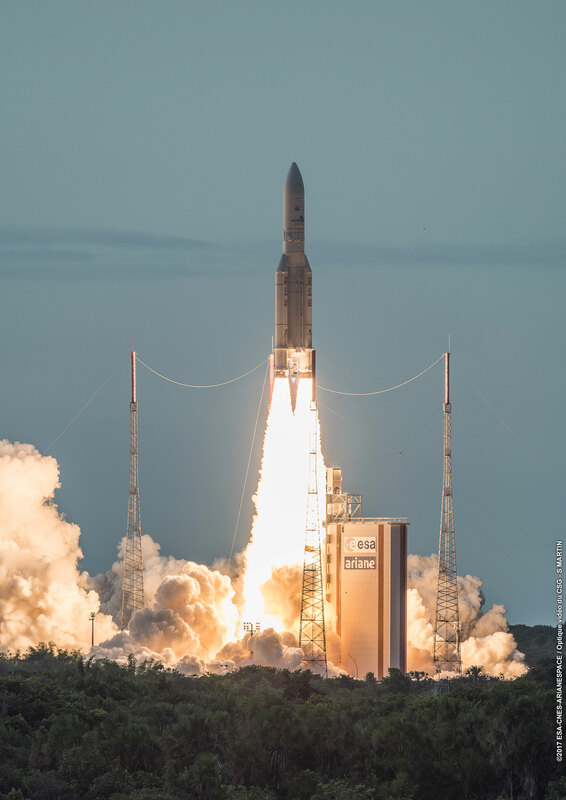 Hellas Sat 3-Inmarsat S EAN also marks key milestones between Arianespace and the two operators: it is the ninth satellite launched at the service of Inmarsat, and the first orbited for Hellas Sat. The dual-payload condosat has a total coverage area that includes spans Europe, the Middle East and sub-Saharan African regions, and will operate from a 39-deg. East orbital slot. GSAT-17 was the 21st spacecraft orbited by Arianespace for the Indian Space Research Organisation, extending a relationship that dates back to 1981 with launch of the APPLE experimental satellite. Built by ISRO/ISAC (the ISRO Satellite Centre) utilizing the Standard I-3K satellite bus, GSAT-17 – with a mass at liftoff of 3,476 kg. – will expand the Indian national space agency’s current fleet of 17 telecommunications satellites. It is to provide continuity of Fixed Satellite Services (FSS) in Normal C and Upper Extended C bands, as well as Mobile Satellite Services (MSS) in S-band and Data Relay and Search & Rescue services in UHF band – operating from a final orbital position of 93.5 deg. East. Arianespace’s next mission is set for August 1, utilizing the lightweight vehicle Vega on a mission to Sun-synchronous orbit. Its two passengers will be OPTsat-3000 for the Italian Ministry of Defense, along with VenµS for the French and Israeli space agencies.